How many times have you thought, “We could solve a lot of problems if we gathered our whole team into one room for a few hours and focused?” If we threw in a few bagels and some Starbucks, I might actually enjoy it. In a fast-paced workplace where plates overflow with responsibility, however, meeting with colleagues for more than a lunch break feels like a luxury. If an idea falls in a forest, and no one is around to hear it … was it ever really an idea? Brilliant ideas fall by the wayside when we have no time or attention for lengthy discussions and brainstorming on deadlines, processes, workflow and how to build a better mousetrap. Not every idea gets implemented, but if ideas aren’t shared, opportunity is lost. Providing opportunities for individual team members to explore concepts with the input of a group that respects the same mission can increase the value of the idea, the individual and the team. When you scan a room full of audiologists and/or speech-language pathologists, you often see a group of intelligent, personable and creative people with great organizational skills. You’re surrounded by a pool of talent! If only you could find time to tap into those valuable resources. What if a meeting of minds included lunch? And you could wear yoga pants? What if the location included comfy couches—and chocolate breaks?! Also, no one needs to run to another meeting afterward? Would you want to go? Then it’s time for a retreat! Yes, a retreat. No one is suggesting taking away personal time. And do not Google “corporate retreats” if you work in a school or health care. Palm trees and spa treatments probably aren’t in the cards. You can help your employer recognize the value of simply bringing the team together. Appoint an organizer. A supervisor or director of a department may best fit the role of organizer. Or delegate to someone passionate about the value of a retreat. If you work in the schools, you’ll likely need to limit options to in-service days. In private practice, where cancelled sessions equal loss of revenue, appeal to the employer by revealing how a retreat might benefit the bottom line. In health care settings, use temporary staff to ensure adequate patient care. Choose a location. Get out of the building. Find a place with a comfortable, relaxed setting, like a neighborhood clubhouse, a colleague’s home or your grandpa’s cabin. Contact your colleagues ahead of time. Identify common problems, ideas for program development, success stories and topics staff want to cover. List your group’s highest priorities and go from there. Stick to it. Create designated time slots to avoid running over. Avoid topics already discussed at regular staff meetings. Don’t just problem-solve current issues. Include opportunities for creativity and innovation. Consider creating a common goal, like a group project. Splurge on lunch, drinks for the entire day—and snacks. Everyone is more receptive to ideas when they can enjoy an assortment of tasty lunch food. Keep it light, so nobody dozes off in the afternoon. Provide a variety of options showing sensitivity to food preferences and needs. Many inexpensive lunch spots provide nice catering options for reasonable prices. Even if you start the retreat after breakfast, provide coffee for the start of the day and possibly a fresh batch with lunch or afternoon snacks, depending on staff preferences for their favorite form of caffeine. Delegate group discussion leaders. Your own colleagues probably offer more interesting and information, because they know the relevant issues intimately. Pair more experienced staff with newer staff in breakout groups. Give newbies a role of leadership to increase feelings of solidarity and equality. Make sure to designate time to hear everyone’s ideas or concerns. If no time remains for full discussion, plan a specific date for following up. 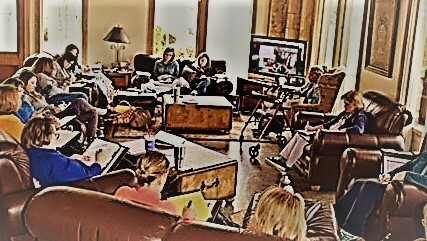 If you think a staff retreat might become a repeat event, take notes! Document the “results” of the retreat. Note new ideas that might become processes and how your employer might benefit from the retreat. Vickie Barnes, M.A., CCC-SLP, is an associate professor at the University of Tennessee Health Science Center. She is the program director of the UT Pediatric Language Clinic which is an early intervention program for children who are at-risk for or have a diagnosis of autism spectrum disorder. Teresa Vaughn, M.A., CCC-SLP, is an associate professor at the University of Tennessee. She has more than 30 years of experience evaluating and treating children with communication disorders. Vaughn also speaks nationally on a variety of topics related to autism. My cousin is planning a corporate retreat for his business soon and wants to get organized. I like that you recommend getting a variety of food option for different preferences and needs. I think having a variety of snacks, and keeping peoples allergies in mind, will show how much the company cares. I’ll have to recommend this to my cousin. Thanks for sharing!